You Save $1.70 by purchasing this kit rather than buying the items separately. COMMENTS: When I was ordering, I didn't see anything that said they would bleed in melt and pour soap. I was quite upset about that. They did do OK coloring my bath salts though. COMMENTS: These colors are beautiful. They are easy to use, and a little goes a long way. I especially love the blue and violet. I will be ordering full size soon. COMMENTS: Love this sample pack! Each bar, only need to shave off what you need, a little goes a long way for me, start out with shaving a small piece, until you get your desired color! "This has to be one of the best colorants!" COMMENTS: Gives very true colors. LOVE, LOVE, LOVE them. Will be purchasing full size next. COMMENTS: These Stained Glass Color Blocks are the greatest for coloring that clear M&P base or clear M&P embeds. Wished I had tried them before this, it makes coloring so much easier. WSP Response: Please be aware that stained glass colors do bleed which means that the concentrated color will leach out to a less concentrated area. If a sort of 'tie-dye' coloring is what your looking for with your embeds then this the the perfect colorant for your projects! "Wonderful for multi colored soap embeds"
COMMENTS: I made some white bar soaps with multicolored embeds (to coordinate with pretty variegated cotton washcloths I'd crocheted) and these really filled the bill. My only caveat is that you, your gift recipients and your customers should use soaps colored with these quickly, as they do bleed like crazy when used as embeds in white soap. I also used the lemon/lime along with a teensy bit of forest green to tint white soap base a bright, juicy green, and used Green Tea FO in it. Bleeding won't be an issue in these soaps, since the soap is colored with it throughout. COMMENTS: I used these to make rainbow layered soap in clear MP and all the colors were absolutely gorgeous. Bright and true and so easy to work with! COMMENTS: This kit come with a great variety of different colorants without spending a lot. My favorite color is the Stained glass ocean blue. "Color Sampler: Soap Color Bars - Stained Glass"
COMMENTS: This was the perfect way for me to try a lot of different colors without getting a large quantity. COMMENTS: Lets me try a bit of everything, and determine what looks best! And perfect for making just a few bars in a hurry. COMMENTS: Nice mix of color bars to choose from at a great value. Gives you some oops room and let's you try out the product. Wish the bars were detergent free -- hint hint! COMMENTS: Colors are great added into melt and pour. Easy and convenient way to color base. COMMENTS: This is a great way to try out all the stained glass colors at a reasonable price before buying full sized packages. Recommended. COMMENTS: Nice to try out the colors!! and I luv every one of them!!! COMMENTS: This is a great option to try out all the colors, I appreciate this purchase option. COMMENTS: Can't wait to use these in my melt and pour soaps! LOVE the lemon lime color block, very vibrant. It seems like these will last for awhile and there's plenty to choose from. Love this sampler kit! I couldn't decide what colors to get in the color blocks and finally decided to just go with a kit. I'm new to soap making and am very impressed/pleased with how quickly they shipped out my order and it was packaged very nicely! COMMENTS: I love this sampler pack. The colors are great. I liked trying each color before buying however I liked them all and each small block goes so far that cut a tiny piece and still have a lot left. I will buy all of the colors again. You only need a small amount to tint soap, whatever. I tinted 12 regular bars of soap with only 1/2 block of one of the colors. This color really does go a long way. And I got a nice color from it. I really love the smooth blending it does. • Easy melting. True colors. COMMENTS: These are lovely colors. I like being able to try each before buying full size. They seem to melt smoother and faster in the clear bases than the white. COMMENTS: Used with m&p soap base. Love the color achieved. COMMENTS: I was skeptical about the "1 cube dyes 5 pounds of soap" but I was incredibly impressed with the results. I have already gone back to reorder some of my more popular colors and will order more of these in the future. COMMENTS: I love this pack as it allows me to sample all the colors without having to throw away tons of money if I dont like one. COMMENTS: Liked everything about this. Even though these are samples, a little goes a long way. I used blue for my little Cameo soaps. The color was so true, mixed easily throughout the goat milk soap base and it only took a little, making this a real money saver. COMMENTS: I used these colors to make my grandkids soap with the vinyl fish in them. I also made some with balls in them. Great colors. "Happy I choose this item"
COMMENTS: I'm very happy that I selected this item. I have been using powder pigments and mixing them with glycerin beforehand, this is much easier! I will be ordering more soon! "Soap Color Bars - Stained Glass"
COMMENTS: I love using/buying sample bars. They make a few products at a great price! 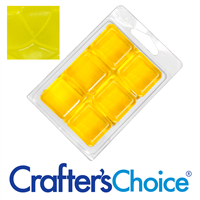 COMMENTS: Best colorant pack out there, works well on both opaque and clear. Of course the clear always shows more bang than white but even when used in white the colors are amazing. WSP Response: Adding this color to white soap will produce a pastel colored bar. Adding this color to a clear base will allow for more light reflection and sparkle colored bar. COMMENTS: I haven't used all the colors yet, but the red, blue and yellow are great! Great value for the price!! COMMENTS: I only make small batches of soap so these samplers are excellent. This one, the stained glass colors, absolutely stunned me. The color is so crisp and bright! I was very pleasantly surprised. COMMENTS: I love the colors these bars produce. They are clear and glass like. However, with all color blocks, if you are coloring small batches of soap (I use MP soap bases) it is difficult to match shade and hue due to the difficulty of getting an exact measurement from batch to batch. HOWEVER! since one block shades up to five pounds or more, depending on how heavy or light you want your color, these are the best for larger batches. COMMENTS: This is an excellent sample set. All of the colors are gorgeous when used in Clear M&P base. I use all the Stained Glass Colors and highly recommend this sample kit if you've never used them. Great deal. COMMENTS: Love it in my clear melt n pour soap!!!!!! !colors so brite. I will definetly order again,! "Red Stained Glass color block." COMMENTS: I love this product. The color is right on and mixes well in the clear base. I use this to make water melon pops. "I love this sample pack so much I bought 2 more." COMMENTS: They are the perfect size to try each color.I love the lime green I use it as the neon green in my Seahawks soaps I make. It matches there uniform color almost perfect. These little bars will color a lot of soap. Each color I have used is really vibrant and I have had no problems with speckling. I will probably buy more sets of this. COMMENTS: Great sampler kit, bought for a Girl Scout project and the girls have found out how to make jus the right colors with these bars. 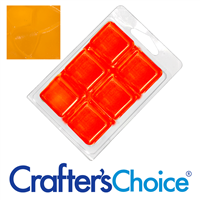 They make their colors using the crafters choice clear base and use the little beakers to heat up the soap and the bar shavings to get great coloring. Will order more in the future. COMMENTS: I have been trying to find a coloring that wasn't over powering but was also easy to use. These are great. I had no problem making the colors as light as I wanted or as dark. I love the idea of the sampler pack because I was able to try many colors in different types of soaps. Another great idea by WSP. "LOVE the Stained Glass Colors!!" COMMENTS: I used these in my CLEAR M&P soap bases. I made a Calendula Soap that I tinted with just a small amount (the TIP of a teaspoon!) of the Yellow color. I added the Calendula Petals- and I swear it looked like a ray of sunshine when you hold it up to the light, lol. These colors let your clear M&P STAY clear, it just adds a colored tint. • Great Variety of Colors! COMMENTS: When I bought this kit, I thought I would only be getting one square of each color, but I got one pack (like shown in the picture). These dyes go a LONG way and they color wonderfully! Non-bleeding. Haven't UV tested them yet, but so far I am very pleased! "Do these fade in clear m&p soap like the liquid stained glass? 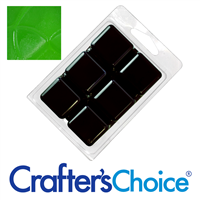 Do you get the same clear glycerin color with these blocks as in the liquid stained glass?" 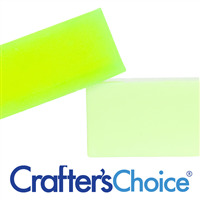 Staff Answer These soap color bars can fade if in the sunlight or overhead lighting. They will produce the same stained glass look as the liquid colors if used in a clear soap base. "1. Are these stained glass soap colors non bleeding? and if they are not, which non bleeding colors do you recommend to biy for MP to achieve the effect of a multi-colored bright transparent MP soap? Many thanks!!" "Could you please tell me which of your colors are All Natural! In my area, no one will buy products with the others. Thank you so much!!!" Staff Answer When choosing a colorant, under the 'Ingredients & Directions' tab you should look at the ingredient listing for each color. The following ingredients are all considered natural ingredients: Iron Oxide, Ultramarines, Titanium Dioxide, Chromium Oxide, Zinc Oxide & Mica. "is vanilla stabilizer needed for this colouring? thanks. " Staff Answer Vanilla Color Stabilizer is used with fragrances that contain vanilla. It is not used when adding any coloring to soap. "Can these colors be used well for loton bars? i am making some fora wedding and would lie to add some natural color tha won't cause skin irritation."